22 years ago, on Monday, January 9, 1989 Pat Sajak’s self-titled late night talk show premiered on CBS. It was yet another try by the network to put a dent into Johnny Carson’s ratings. 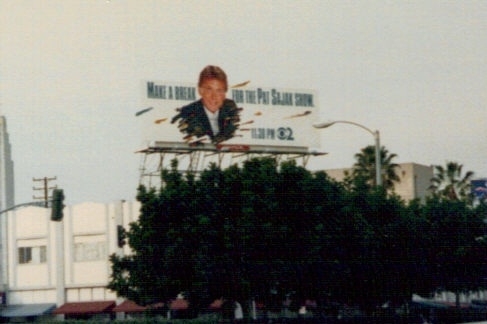 Billboard in Los Angeles promoting "The Pat Sajak Show" circa 1989. “The Pat Sajak Show” was a traditional late night talk show with bandleader Tom Scott and announcer/sidekick Dan Miller, who Sajak had worked with on news broadcasts in Memphis in the 1970s. Besides competition from “The King of Late Night,” Johnny Carson, Sajak also had to contend with Arsenio Hall, whose own late night talk show had debuted just six days earlier. With Carson holding on to his older, loyal audience and Hall pulling in a younger, hipper audience, there just weren’t enough viewers tuning in to Sajak. “The Pat Sajak Show” ran for only 15 months and went off the air in April 1990.